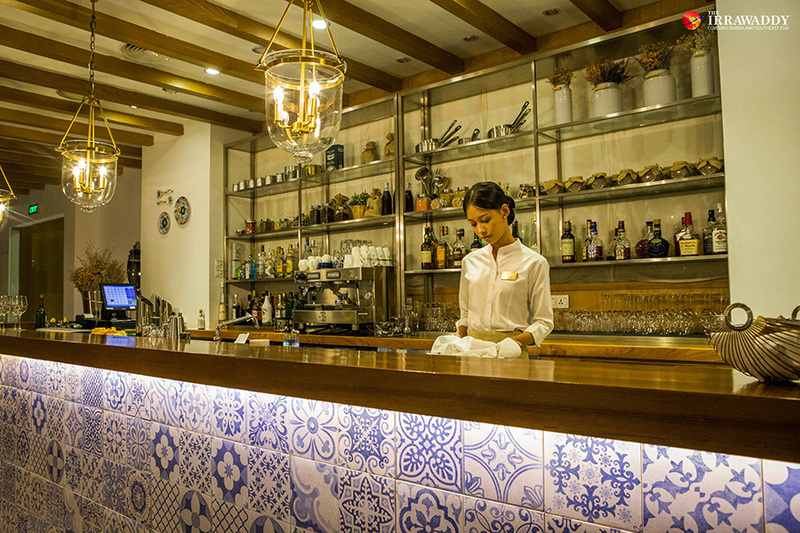 YANGON—Aiming to introduce Spanish food and culture to local diners, Olea, the modern and charming Mediterranean restaurant at Melia Hotel Yangon, has a Spanish food menu at amazing prices for the whole of October. Olea’s new executive chef Lluis Cantons Pesarrodona has designed and will serve an entire menu of Spanish food and the Spaniard promises pure, authentic Spanish food experiences for all. “I selected some basic Spanish foods which can perfectly suit the local taste,” said Chef Lluis. Olea exudes a real Mediterranean atmosphere which is unique in Yangon. The restaurant is beautifully decorated in bright shades of white, blue and cream. Even the crockery has Mediterranean-style blue and white patterns. Even though it’s a hotel restaurant, there is plenty of natural light flowing through. With relaxing and comfortable oversized sofas, this is the perfect setting for an afternoon tea or dinner. Here in Yangon, Spanish food is not very popular among locals and there are few Spanish restaurants. 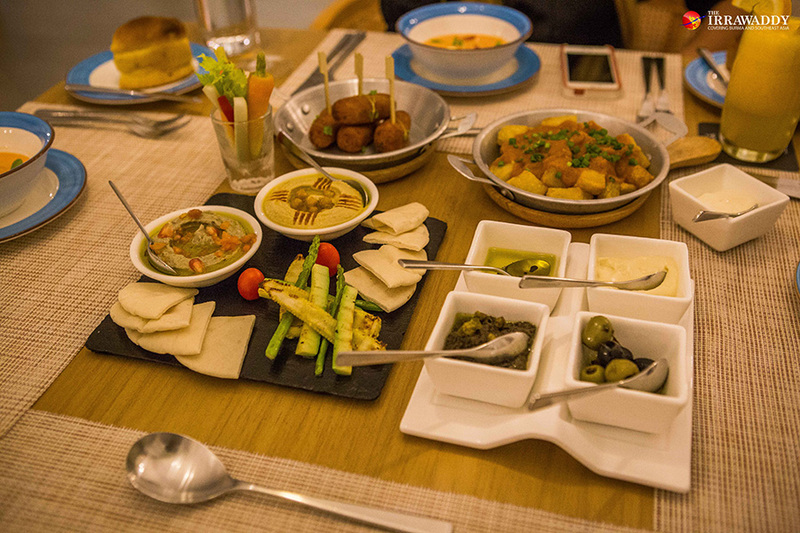 “That’s why we would like to introduce the Spanish food culture to our Myanmar people,” said Ko Htet Myint Ko Ko, marketing and communications manager of Melia Hotel Yangon. 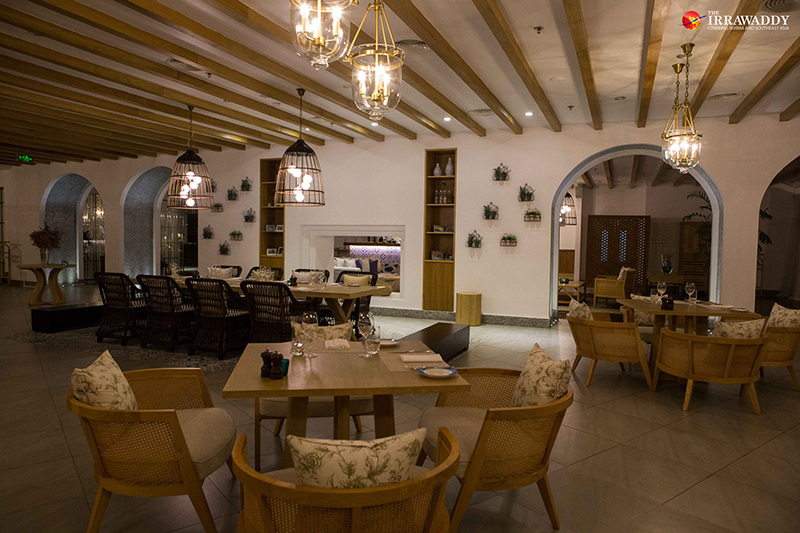 The regular Olea menu features dishes inspired by traditional, basic cuisine from Mediterranean countries including Greece, Spain, Italy and France. Since October is “Spanish Food Month” at the restaurant, we decided to go on something of a tour of Spanish food. 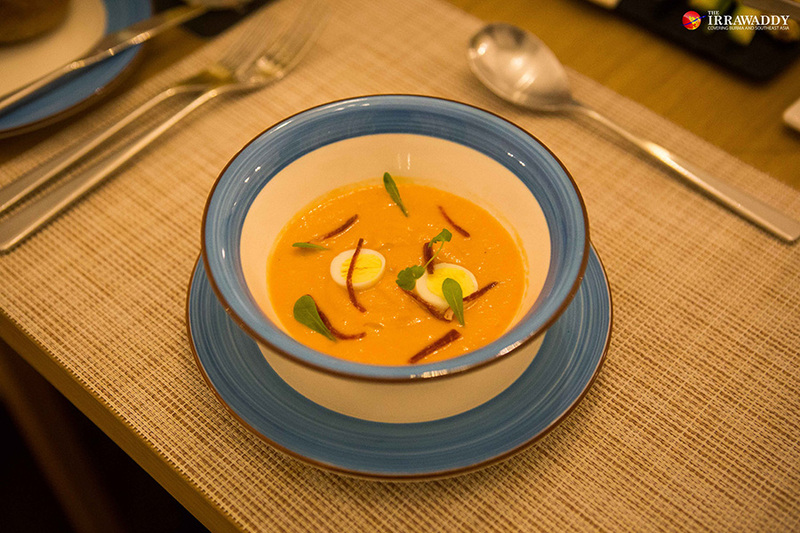 We started with the salmorejo ($6), a thick, cold tomato soup topped with boiled quail egg. The presentation of the dish is really pretty and it had a refreshingly sour taste. It’s served in a bowl and I couldn’t finish it all. The patatas bravas ($7) is made of fried potato wedges served with a spicy tomato sauce. This one is a basic and popular Spanish tapas dish, according to Chef Lluis. The fried chunks of potato are golden and crispy and the tomato sauce is a little sour and not very spicy. When mixed up and eaten, the taste is really perfect. 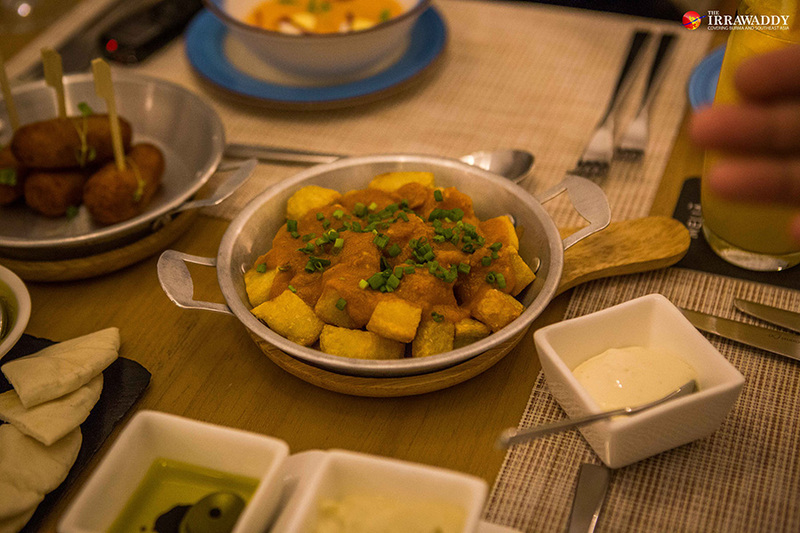 “Patatas bravas is the most common Spanish tapas and it’s perfect with beer,” said Chef Lluis. Another popular Spanish food called jamón Iberico ($9) is also offered as an appetizer. Jamón is cured ham and Olea’s version comes from the black Iberico pig. The thin slices of ham are salty and the flavor left on the tongue is pleasing. It can be eaten on its own or with bread. Olea’s homemade breads are also great. 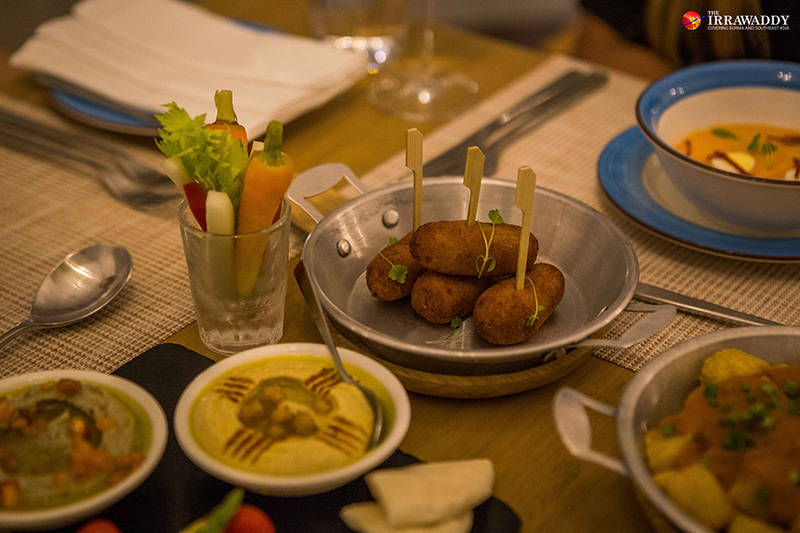 The last tapas we tried is croquetas ($8), a ham and chicken croquette, served in four small tubes. This croquette is a marvelous blend of crunchy and creamy and I really loved it. My stomach was almost full of tapas before the main dish even arrived. 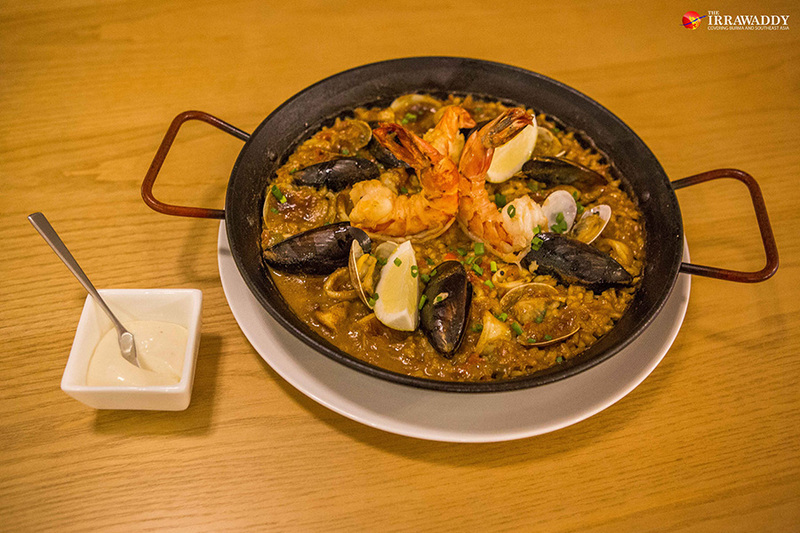 The staff next served the main dish, seafood paella ($23), which is a mix of prawns, squid, clams, lobster and rice. This one is the most famous Spanish rice dish and the chef hopes locals will love it. The large portion is enough for two people and it is served on a pan. The seafood is mixed together with beans, rice and herbs and is a yellow color with three big lobsters placed on the top. Our Spanish food tour ended up with a dessert of churros ($5). Churros is a hot, fried doughy pastry coated with sugar crystals and served with chocolate sauce which is a popular, sweet Spanish snack. All of the flavors were perfect and the dishes are worth their prices, especially considering the high-quality ingredients and the whole dining experience in a five-star hotel. So if you are a foodie and would love to try Spanish food, Olea is now serving a variety of great Spanish tapas and dinner dishes for the month of October at a discounted promotion price.